Food Friday: Salmon Head ~ I Can Do That! 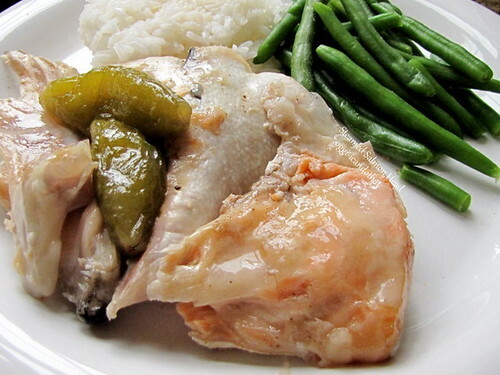 Most recipes for salmon head are soup, either Japanese with miso or Filipino style with souring agent. I was not in the mood for any soup as it's too hot for that. I steamed 2 pieces in sour fruit (kamias) and sea salt and broiled the other 2 just with sea salt then served with calamansi. DE.LI.CIOUS! Place 2 layers of banana leaves in a stainless steel skillet. 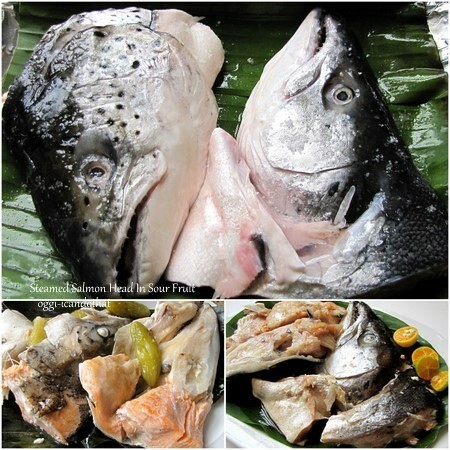 Put salmon head on banana leaves and sprinkle both sides with sea salt. Place sour fruit on top of salmon head. Cover with more banana leaves. Add a quarter cup of water on the bottom of the skillet. Cover and steam cook for 20 minutes or until flesh flakes easily, adding a tablespoon of water if needed during steaming. If banana leaves and sour fruit are not available, use non-stick aluminum foil and sliced lemon. hi after reading these comments I just started to steam a salmon head for 1st time! i just bought a whole salmon and didnt know what to do with the head! !